Last weekend, my husband and I couldn’t find a natural geological formation in Shannon County called The Sinks. While out in the countryside, I did what any curious tourist would do when posed with such a predicament. I flagged down a moving vehicle to ask its occupant where in the world The Sinks were located. 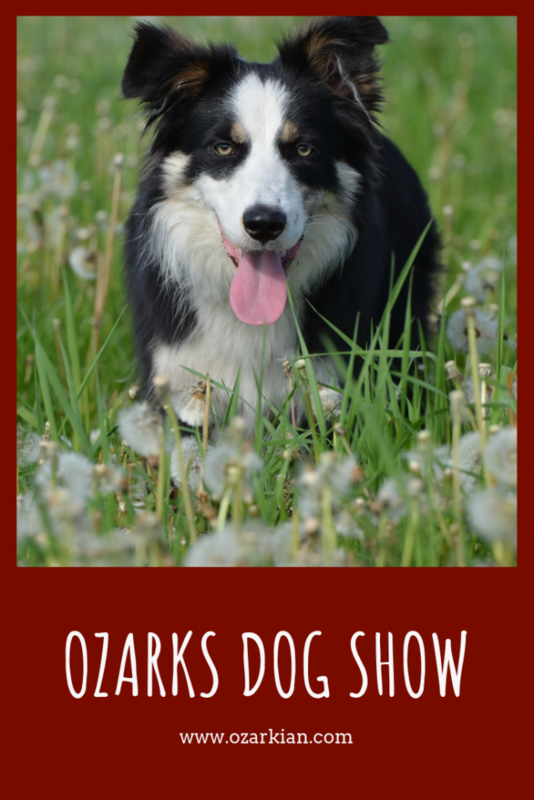 A dog show in the Ozarks? 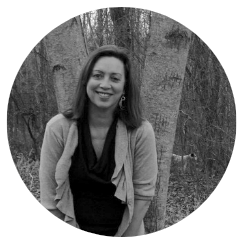 I wondered if it would be a precursor to any bigger shows in the state, or even in the county. We turned the truck around and went down to the farm in the holler, called Bald Eagle Ranch, near an ox-bow lake. What a gorgeous view we had—with the clear sky-blue sky, hills covered in pines, and verdant wild foliage springing up all around. 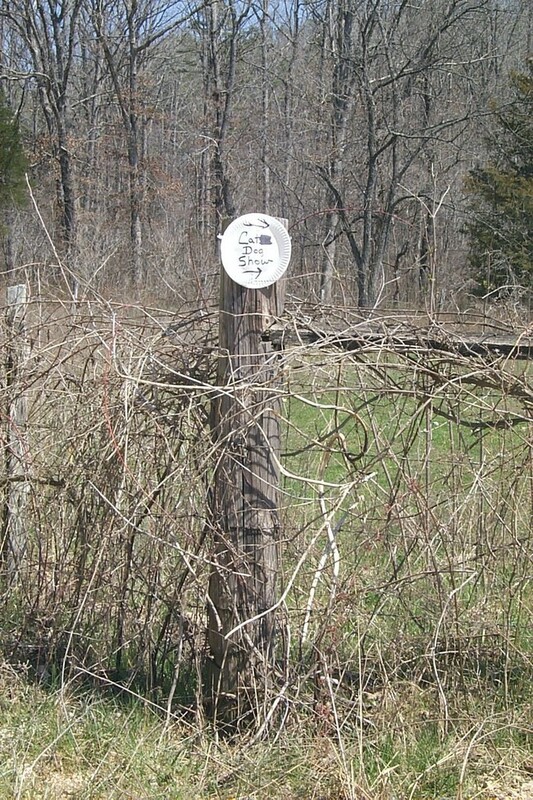 Upon entry to the farm, we noticed the official sign—a Styrofoam plate tacked to a fence post that read, “Cat█ Dog Show.” Well, how about that? It was also a cat show. This could be interesting. And, as usual, it was. About 113 cars lined the driveway to the old farmhouse. Cattle pens were located out back of the house. Folks were everywhere: standing around, sitting at picnic tables, eating hamburgers, and basically, chewing the fat. I started looking for the show tables, the judges, the cages. What I saw surprised me. There were no cats and lots of dogs—all border collies. When I found the man in charge (Again, doing what any curious Ozarkian would do, I asked the woman at the food counter if she knew who was in charge, and she did.) named Mr. K.D. Swiney, and he told me this show was for cattle dogs. We had arrived at just the right time, too. The judges mounted the platform—stepping up to the tailgate of an old pickup and plopping into their lawn chairs. The judging platform was located next to the fences and near the horse trailer. The first pair to compete, Jim Hill and his dog, Willie, took the field. Three big yearling calves were turned loose into the pen, and Willie and Jim started working together. Willie took off, running a pear-shaped route out and around the cattle. This is the part of the competition where the dog must judge how close he can get to the herd. If he gets in too close, too fast, he’ll spook them into running. They’ll also be skittish for the rest of the trial. Jim shouted commands such as, “Lay low, Willie,” and “Come by, Willie.” He also waved a shepherd’s crook around. Willie ran around and around the cattle mostly, and then, when Jim told him to “Lay low,” he did—with his nose pointed toward the herd. Supposedly, this is the part of the competition where the dog uses his “eye,” to hold the sheep or cattle. When the dog lies low, it’s called “clapping.” The combination of clapping and strong-eye creates the illusion of a predator, and I don’t think any animal on earth enjoys the position of being eyeballed and challenged at the same time. After about three minutes, Jim and Willie had accomplished the task of running the cattle to different sections that were marked in the pen, through two chutes and then, onto the truck. When Willie was done, he went and lay in the shade of the horse trailer. Hill talked to me afterwards, stressing the importance of a well-bred dog. 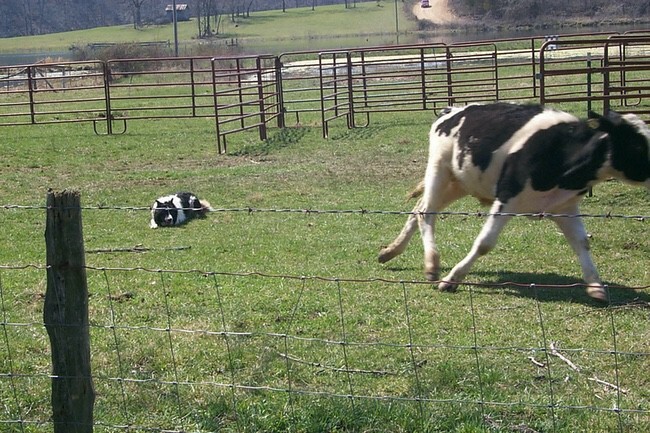 If you own a border collie from a good lineage, he will naturally want to work and herd cattle or sheep. Then, it was Odie’s turn to run the route. But Odie wasn’t too keen to work cattle that day. I heard Odie’s master telling the fellow in the nearby lawn chair that Odie is now on the Internet. But, Odie needs more training if he wants a television show, I think. I could have spent the whole afternoon out there with those people and those dogs. 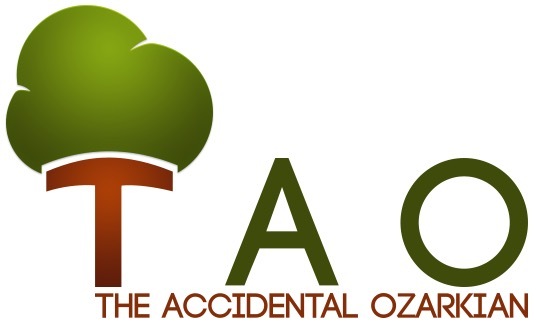 It’s good to know that you can rub elbows with people who appreciate the finer things in an Ozarkian lifestyle, such as owning a good dog and spending some time with old and new acquaintances. Actually, folks have been rubbing elbows at sheep dog trials since 1873, where the first trial was held in Bala, Wales. Today national and international trials are held and sometimes, televised. The show at the Bald Eagle Ranch is always held the first Saturday in April. It’s been running for 12 years. For more information about the dog show, call Bob Cavanaugh at 573-858-3311. Oh, and the cat show? Why that was just one of them old boys playing a prank. He had apparently taken a marker and inked out the “tle” in Cattle Dog Show. The fellas had a good laugh about that . . . about having a dog and cat show. Feel free to pin this great photo of a border collie on your Pinterest!